Hypothesis A sufficient decline in levels of parathyroid hormone measured intraoperatively (ioPTH) precludes early and late surgical failures. Design A case series of consecutive patients undergoing parathyroidectomy with ioPTH measurement. Patients and Intervention Two hundred sixty-nine consecutive patients with sporadic primary hyperparathyroidism who underwent first-time parathyroid surgery with ioPTH measurement were followed up for as long as 10 years after surgery. Data on all patients have been collected in a prospective database. Main Outcome Measures Surgical failures up to 10 years after parathyroid surgery. Results With an average follow-up of 3.6 years (range, 6-120 months), the overall cure rate was 96%. The ioPTH level correctly predicted long-term outcome in 248 (92%) of 269 patients. Six patients had a false-positive ioPTH finding. Five of these patients were found to have germline mutations in the gene for multiple endrocrine neoplasia. The remaining patient has not undergone genetic testing. The mutations have rarely (n = 1) or never (n = 4) been described before, to our knowledge. Conclusions Intraoperative measurement of PTH level has a high overall accuracy with a mean follow-up of 3.6 years. However, among the late surgical failures with false-positive ioPTH findings, overlooked mutations in the multiple endocrine neoplasia gene should be suspected, and therefore genetic analyses in these patients are of great importance. We have previously reported our experience and the 5-year results of the initial 102 patients who underwent parathyroid surgery with ioPTH measurement.9 None of them were found to have false-positive ioPTH results. In the present study, we reviewed surgical failures among 269 patients with pHPT undergoing parathyroid surgery in combination with ioPTH measurement and a follow-up period of as long as 10 years. Consecutive patients who underwent first-time surgery with ioPTH measurement for sporadic pHPT were followed up within 6 months after the operation and then yearly. The mean follow-up time was 3.6 years (range, 6-120 months). Data on all patients were collected in a prospective database. The main outcome measure was surgical failure, including persistent and recurrent disease. Persistent pHPT is defined as hypercalcemia and high PTH levels occurring any time within the first 6 months after pHPT surgery. The occurrence of hypercalcemia and high PTH levels (without renal failure) after a documented period of postoperative normocalcemia, lasting at least 6 months, is classified as recurrent pHPT. The study included 269 consecutive patients, 68 men and 201 women, with a clinical and biochemical diagnosis of sporadic pHPT who underwent first-time parathyroid surgery with ioPTH measurement between September 1, 1989, and May 30, 2003. The mean ± SD patient age was 65 ± 14 years. The mean ± SD preoperative serum calcium level was 11.1 ± 0.8 mg/dL (2.78 ± 0.19 mmol/L), with a mean ± SD intact serum PTH level of 107.3 ± 77.9 pg/mL. Twenty-four patients had slightly raised levels of serum creatinine. Thirty-six patients were considered asymptomatic. The criterion for parathyroidectomy was symptomatic pHPT or significantly increased calcium levels in asymptomatic cases. Twenty-five patients underwent video-assisted parathyroidectomy by a lateral approach,10 and 39 underwent intentional bilateral exploration. All of the other patients (n = 205) underwent neck exploration according to the principles of unilateral approach.11 The technique has been modified over time, compared with the original description. Thus, a preoperative localization study is performed and ioPTH level is used as a guide for when to stop surgery. We do not perform a complete excision or a biopsy of the normal-appearing gland. No attempts are made, per se, to visualize normal glands. Hence, the current method for unilateral exploration is as follows: If an adenoma is found on the first side explored, it is excised and no more exploration is performed. If the adenoma is not found on the first side, or the ioPTH finding is inconclusive, comprehensive bilateral exploration is performed. During the continuous exploration, repeated samplings just before and after each additional abnormal gland excision are used to guide the surgeon when to terminate the procedure, ie, when all abnormal parathyroid glands are excised as confirmed by a significant fall in the ioPTH level. The decline in serum level of intact PTH was determined during surgery in all patients. After finding an enlarged parathyroid gland, blood samples were drawn for measurement of intact serum PTH levels before and at 5 and 15 minutes after gland excision. The criteria used to determine when to terminate exploration have been described previously.12 Briefly, a decline 15 minutes after parathyroid gland excision of 60% or more below baseline (obtained when the first enlarged gland is visualized) reliably predicts a solitary parathyroid adenoma and early and late operative success.9 All blood samples were drawn from a peripheral vein. All blood samples were collected after an overnight fast. Preoperative data were obtained within a week of the scheduled operation date. Serum levels of total calcium (reference range, 8.8-10.4 mg/dL [2.2-2.6 mmol/L]) and creatinine (reference range in men, 0.6-1.3 mg/dL [55-116 μmol/L]; in women, 0.5-1.1 mg/dL [45-100 μmol/L]) were measured with routine methods on an autoanalyzer (Hitachi 917; Roche Hitachi, Walpole, Mass). Serum levels of intact PTH were measured with the intact PTH assay (Inkster, Stillwater Minn) (reference range, 9.5-47.5 pg/mL). To shorten the time for intraoperative analysis, the assay was modified as previously described.12 The time for incubation could thereby be reduced to 20 minutes, giving an interval between sampling and availability of the assay result of about 30 minutes. The within-assay variation of 7.6 to 95.0 pg/mL is less than 8% for the rapid method. The correlation between the methods is 0.99. Analyses for germline mutations in the genes for multiple endocrine neoplasia types I (MEN1) and II (MEN2) were performed at the department of Clinical Genetics, Karolinska Hospital, Stockholm, Sweden, by means of full-sequence analysis of the coding and noncoding regions of the menin gene14 and the RET proto-oncogene,15 respectively. The result of the genetic testing was not considered definite until results of a second confirmatory test were obtained. Results are expressed as mean ± SD unless stated otherwise. The efficacy of ioPTH findings for long-term operative success was calculated. 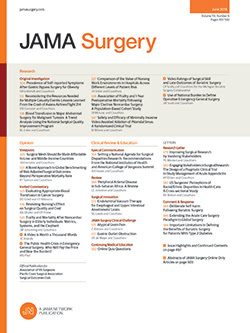 The accuracy calculations were based on the following definitions: The ioPTH result was considered true positive when it correctly predicted long-term postoperative normocalcemia; true negative when it predicted incomplete excision by resection of an additional gland(s) or persistent pHPT; false positive when it incorrectly predicted long-term normocalcemia in patients with persistent or recurrent pHPT; and false negative when it incorrectly predicted incomplete excision despite postoperative normocalcemia. In the present cohort of 269 patients with first-time cervical exploration for pHPT and ioPTH measurement, 132 patients ultimately underwent unilateral exploration (including 20 of 25 patients undergoing the video-assisted parathyroidectomy by a lateral approach). The other 137 patients underwent bilateral exploration. In the 269 patients, 289 abnormal glands were excised. Two hundred fifty-one patients (93%) had a solitary adenoma with a median (range) weight of 0.65 g (0.07-9.50 g). Eighteen patients had multiglandular disease. The mean decline in ioPTH level in 251 patients with primary exploration as a result of solitary adenoma was 78% ± 15% after 15 minutes. In all but 14 patients, the decline 15 minutes after parathyroid gland excision was 60% or more below the baseline level. The 14 patients underwent bilateral exploration with no evidence of more than 1 enlarged gland. However, 2 of them showed postoperatively persistent pHPT. The 18 patients who initially underwent the operation because of multiglandular disease were correctly predicted by the ioPTH finding not to have an adenoma. The mean decline in ioPTH level in this group was 28% ± 25% after 15 minutes. With an average follow-up time of 3.6 years after parathyroid surgery, 258 patients had normal (n = 253) or slightly decreased (n = 5) mean serum levels of calcium (9.4 ± 0.4 mg/dL [2.35 ± 0.11 mmol/L]). Six patients had persistent hypercalcemia and 5 patients had recurrent hypercalcemia (Table 1). The overall surgical cure rate was therefore 96%. Of the 6 patients with persistent pHPT (Table 1), 4 (67%) had a decline in ioPTH level 15 minutes after gland excision that was less than 60% below baseline, hence predicting persistent disease. In 2 of these 4 with true-negative ioPTH findings, only 1 enlarged gland, histopathologically classified as an adenoma, was found despite comprehensive bilateral exploration identifying all 4 glands. In 1 patient, 3 glands were identified and 1 enlarged gland was excised. Thus, 1 gland was missing at the operation. In still another patient, a left-sided vocal cord paralysis after prior bilateral thyroid surgery was revealed by preoperative indirect laryngoscopy. At the operation, the patient underwent exploration on the left side only, where an enlarged gland was removed. In the remaining 2 patients with persistent pHPT and in 5 patients with recurrent pHPT, the decline in ioPTH level was 60% or more at 15 minutes after gland excision, suggesting false-positive ioPTH findings (Table 1). In 1 of these patients (patient 141), hypercalcemia (serum calcium level, 10.6 mg/dL [2.65 mmol/L]) developed 5 years after the operation, with an elevated serum PTH level (104.5 pg/mL). However, during this 5-year period, uremia also developed with a glomerular filtration rate of 17 mL/min. After the start of hemodialysis, the patient became normocalcemic (serum calcium level, 9.6 mg/dL [2.39 mmol/L]), with a PTH level of 170.9 pg/mL, clearly suggesting secondary HPT. Thus, strictly speaking, this patient should not be classified as having a false-positive ioPTH finding. Five other patients were found to have mutations in the MEN1 gene (menin gene on chromosome 11) and MEN2 gene (RET proto-oncogene on chromosome 10) (Table 2). In 4 of these patients, the mutations have never been described before, to our knowledge. None of the 5 patients had any known family history or clinical signs of MEN 1 or MEN 2 syndrome before the operation. Furthermore, 4 of these patients underwent bilateral exploration. Finally, patient 36, a 74-year-old woman with severe Parkinson disease, was also found to have persistent pHPT despite a bilateral exploration (with negative scan results) with visualization of 4 glands and a decline of 65% in ioPTH level. We have not been able to obtain MEN1 and MEN2 gene analyses from this patient. Patient 121 was a 41-year-old woman who underwent preoperative sestamibi scintigraphy indicating a left upper parathyroid adenoma. At the operation, the scan results were found to be wrong. All 4 glands were therefore identified and a right lower enlarged gland embedded in the thyrothymic horn was removed. The decline in ioPTH level was 63% and the histological findings showed a parathyroid adenoma (weight, 0.70 g) with a somewhat follicular picture of chief cells and a rim of residual suppressed parathyroid tissue. Her postoperative levels of serum calcium and PTH were normalized and stayed within the reference range until 10 years after the operation. As shown in Table 2, a mutation was found in the MEN1 gene. Results of subsequent biochemical and radiographic tests for pancreatic endocrine tumors and pituitary tumors have been negative except for the finding of a 6-mm nonfunctioning pituitary microadenoma. Genetic testing has shown the same mutation in 1 of her 2 sons, but no mutation in her brother. Sestamibi scintigraphy and ultrasonography indicated a left lower enlarged parathyroid gland, which was confirmed at reoperation. The decline in ioPTH level after 15 minutes was 82%, and the histological findings once more indicated an adenoma (weight, 0.25 g) with a clear rim of normal glandular tissue in the right thyrothymic horn. At the 6-week follow-up, the serum level of calcium was 9.6 mg/dL (2.39 mmol/L), and the level of serum PTH was 34.2 pg/mL. In patient 226, a 69-year-old woman, 2 of only 3 identified glands were excised. Both glands (weights, 0.72 and 0.40 g) showed primary chief-cell hyperplasia arranged in a nodular pattern. Five years after the operation, recurrent pHPT developed. A mutation in the MEN2 gene was found (Table 2). No family history was detected, and a diagnostic workup for medullary thyroid carcinoma (including baseline measurement of calcitonin levels) and pheochromocytoma was negative. This patient has not undergone reoperation (mild hypercalcemia and no symptoms). The decline in ioPTH level 15 minutes after gland excision was not sufficient until all 4 glands were identified and 2 enlarged glands with nodular hyperplasia (weights, 0.15 and 0.23 g) were removed in patient 275, a 43-year-old man. However, the normocalcemic state lasted only a year. A subsequent genetic analysis demonstrated a mutation in the MEN1 gene (Table 2). No family history has been found, and initial biochemical (including levels of chromogranin A and pancreatic polypeptide) and radiographic tests for pancreatic endocrine tumors and pituitary tumors have been negative. Patient 288 was a 55-year-old woman who had undergone removal of a left lower gland identified on a scan. The decline in ioPTH level after 15 minutes was 76% and the histological analysis showed a parathyroid adenoma (weight, 0.72 g). However, at 1 year after surgery, the patient had a serum calcium level of 10.4 mg/dL (2.60 mmol/L) and a serum PTH level of 104.5 pg/mL. Furthermore, she was found to have a germline mutation in the MEN2 gene (Table 2). No family history of MEN 2 or clinical signs of MEN 2 syndrome were found. Subsequent tests for pheochromocytoma and medullary thyroid carcinoma (including baseline calcitonin level, provocative pentagastrin stimulation test, and ultrasonography) were also negative. Sestamibi scintigraphic and ultrasonographic findings were both negative. At reoperation, a right upper gland was excised, the remaining 2 glands being of normal size. The decline of ioPTH level was 87% after 15 minutes. Histological findings showed an adenoma (weight, 1.18 g) with a rim of normal glandular tissue. At follow-up, 6 weeks after the reoperation, the serum calcium level was 9.5 mg/dL (2.38 mmol/L) and the serum PTH level was 57.0 pg/mL. Finally, patient 319, a 31-year-old woman without a family history of pHPT, underwent operation with a comprehensive bilateral neck exploration that identified 4 glands. A chief-cell adenoma (weight, 1.66 g) with a rim of normal glandular tissue was excised, and the ioPTH level showed a sufficient decline after 15 minutes. However, the patient had persistent pHPT. A prolactinoma had been diagnosed and medically treated. Furthermore, a mutation in the MEN1 gene has been confirmed (Table 1). The patient has so far refused further examinations. A decline in ioPTH level of 60% or more 15 minutes after gland excision correctly predicted long-term postoperative levels of serum calcium in 248 (92%) of 269 patients and incorrectly predicted the late outcome in 21 (15 with a decline in ioPTH levels of <60% and 6 with a decline of ≥60%). In the 248 patients with an accurate prediction, there were 244 true-positive ioPTH findings and 22 true-negative ioPTH findings. Among the latter, 4 patients were known to be failures already at the operation. Thus, the method had an overall accuracy of 93%, a sensitivity of 94%, a positive predictive value of 98%, and a specificity of 79%. Although a sufficient decline in ioPTH level has been reported to be associated with excellent early3-5 and long-term9 results, there are still some concerns about the benefits of the method, because several studies have reported a varying degree of false-negative and false-positive ioPTH results.6-8 In the present study, we reviewed surgical failures in a cohort of patients who underwent parathyroid surgery in combination with ioPTH measurement and with an average follow-up time of 3.6 years (range, 6-120 months). Special attention was given to patients with false-positive ioPTH findings. When comparing the reported accuracy of ioPTH findings between different studies, it is essential to look at the following items. First, what are the characteristics of the patients under study? Are patients with secondary HPT, familial HPT, or MEN included? Our criterion12 as well as the criterion used by most other series (ie, a PTH decrease of ≥50% after 10 minutes)4,6-8 is constructed to predict postoperative normocalcemia in patients with sporadic pHPT and not in patients with other causes of HPT. Special ioPTH protocols for the handling of patients with secondary HPT16 and MEN 117 have been proposed, but have so far not been validated. Second, it has been well demonstrated that modifications of the technical aspects of ioPTH measurement and the applied criterion have a significant impact on the overall accuracy of the test.18 Third, the site of blood sampling is of importance and, in our opinion, samples should be obtained from a peripheral vein and not from the jugular vein because the latter will be more affected by the manipulation of the gland during the dissection. Furthermore, a parathyroid tumor upstream or downstream from the sample site in the jugular vein will influence the PTH level differently. Finally, did the termination of the operation rely on the decline of ioPTH level or on the gross morphology? The reported proportion of patients with multiglandular disease has been found to be considerably lower in series with a focused unilateral approach and ioPTH measurement (about 5%), ie, a biochemical definition of a hyperfunctional gland, than in studies in which the extent of parathyroid tissue resection is based on bilateral exploration (about 20%), ie, a gross morphological definition of a hyperfunctional gland.19 Critics have expressed concern that enlarged hyperfunctioning glands may be left in situ, leading to higher failure rates in terms of persisting and recurrent disease.19 This concern is largely based on studies that have shown, during bilateral exploration, a number of patients with a remaining enlarged gland after the hyperfunctioning gland had been excised (with a significant decline in ioPTH level).6-8,20 However, because these enlarged glands were removed, it is not proved that these glands, if left in situ, would have caused persistent or recurrent disease. In addition, from other fields of endocrine surgery (eg, the adrenals and thyroid and pituitary glands), it is well known that size and hyperfunction are not always linked. So far, reported long-term results support a biochemical definition of a hyperfunctional parathyroid gland in sporadic pHPT,9 which would mean a shift in the accepted pathophysiological paradigm. However, there is a need for more long-term follow-up studies, such as the present investigation, to determine whether this is true. The risk of postoperative hypocalcemia, the other side of the coin, is rarely addressed in the literature. Only 2 studies21,22 with long-term follow-up (ie, mean, ≥10 years) after conventional bilateral pHPT surgery have presented results on this issue. Both studies demonstrated, in addition to an 8% rate of persistent or recurrent disease, hypocalcemia and/or cholecalciferol (vitamin D) therapy in about 8% of the patients. In the present study, 5 (1.9%) of the patients demonstrated postoperative biochemical hypocalcemia, and only 1 required cholecalciferol supplementation. A provocative question, with no answer at present, would be whether bilateral explorations with resection based on gland size, in addition to a higher incidence of early hypocalcemia,23,24 in the long run also have a higher rate of hypoparathyroidism compared with procedures based on ioPTH findings. Furthermore, in terms of life quality, morbidity, and even mortality, to our knowledge, no study so far has addressed the issue as to which is worse, a mild hypercalcemia or a mild hypocalcemia. In the present study, 6 patients (2.2%, not including patient 141, in whom secondary HPT developed) were, after an average follow-up time of 3.6 years, found to have persistent or recurrent pHPT despite a sufficient decline in ioPTH level. Using our definition, which is intended to determine the accuracy of ioPTH level in predicting long-term success, they were considered to have false-positive ioPTH findings (as described in the “Statistics” subsection of the “Methods” section). If we instead used the definition reported by the Miami, Fla, group,18 which is intended to predict only the absence of persistent pHPT, our false-positive rate would have been 0.7% (n = 2). One of the major clinically important findings in the present study was the high incidence of unobserved MEN syndromes in the group of patients with false-positive ioPTH findings. Thus, 5 of the 6 patients with false-positive ioPTH findings in this cohort of 269 patients presumed to have sporadic pHPT were found to have germline mutations in the MEN1 (menin gene on chromosome 11)14 and MEN2 genes (RET proto-oncogene on chromosome 10).15 Unfortunately, we have not been able to perform genetic testing on the remaining patient with the false-positive ioPTH finding (patient 36). The identified mutations have rarely (eg, patient 226)25 or, to our knowledge, never been described before. These patients with unnoticed MEN mutations were hidden in a cohort of what seemed to be clinically sporadic pHPT, and they were associated with false-positive ioPTH findings. Furthermore, the variability in the number of glands affected at the primary diagnosis and the irregularity in time to a noticeable recurrence among these cases was intriguing. According to conventional histopathological criteria,13 3 of the 5 patients with MEN mutations had a histopathological diagnosis of parathyroid adenoma, including the presence of a rim of normal glandular tissue. In the cases of patients 121 and 288, the same histopathological picture was found on reoperation. Although somatic mutations in the MEN1 gene have been found in as many as nearly 20% of parathyroid adenomas,26 to our knowledge an association between unobserved germline MEN mutations and a false-positive ioPTH finding has never been presented before. Others have reported technical errors, a diagnosis of parathyroid cancer, or simultaneous thyroid intervention as causative reasons for false-positive ioPTH findings.18,27 Except for patients 121 and 319, the latter of whom was found to have pituitary tumors, all of the other patients have thus far been found to have HPT only, despite thorough examinations for manifestations of the other tumor types. Especially for the 2 patients with MEN2 mutations, this is a thing to be noted because HPT is a variable component and usually not the initial manifestation in MEN 2.28 Mutations at codon 634, particularly a cysteine-to-arginine substitution, have been associated with great risk of HPT in MEN 2.29 In the present study, neither of the 2 patients with MEN2 mutations showed a mutation at this codon. Future follow-up and genetic testing in the different families will show whether the presently described mutations are predominantly associated with pHPT. In the new era of minimally invasive parathyroid surgery, the rate of false-negative findings represents a special and important problem, because these findings lead to additional exploration and/or conversion to an open procedure. Therefore this rate should be as low as possible. In the present study, which used a preexcision value as baseline, 5.6% of the patients had a false-negative ioPTH finding. A preincision value in addition to a preexcision value has been shown by others to lower the rate of false-negative findings if the decline is calculated from the highest preincision or preexcision level.18 Occasionally false-negative ioPTH results are caused by a delayed drop in ioPTH level. Whether sample timing or the altered half-life of PTH is responsible for the delay has to be investigated. However, in such cases, an additional PTH sampling (>15 minutes after gland excision) may be beneficial. In addition, recent promising results indicate that the new generation of immunometric PTH assays, which detect (1-84) PTH exclusively, and not non–(1-84) PTH (likely [7-84] PTH),30 may improve the accuracy of ioPTH measurement,31 since the (7-84) PTH fragments have a longer half-life than (1-84) PTH. Further studies are warranted because these assays require a long incubation time and are not currently applicable for intraoperative decision making. In conclusion, our case series (with a mean follow-up of 3.6 years) shows that the ioPTH level has a high overall accuracy. However, among the late surgical failures with false-positive ioPTH findings, a high incidence of overlooked MEN mutations can be suspected, and we suggest that genetic analyses in these patients are of great importance. Correspondence: Johan Westerdahl, PhD, Department of Surgery, Lund University Hospital, S-221 85 Lund, Sweden (johan.westerdahl@med.lu.se). Accepted for Publication: May 12, 2005.